The 2:30 p.m. post time for Friday’s first race seemed to make the crowd friskier, if not significantly different in size from prior summers. But there was no waiting for things to unfold at a new pace. A flow of energy cursed through the clubhouse and grandstand, unlike the last several days. The music began playing at Siro’s before the eighth race went off−somewhat earlier than usual in terms of the feature but not by the standard for what people believe is the cocktail hour. “The absolute prime time is between 6 and 7 p.m.,” said Michael W. Stone, general manager of Siro’s. “When races go longer than the normal nine, that’s very difficult to overcome,” he added, making note of the fact that inordinately long programs as well as late posts were a problem. The winner Bravo Habibi crossed the finish line for the last race with two minutes to spare in the golden hour. One hour later, downtown was a sea of people. 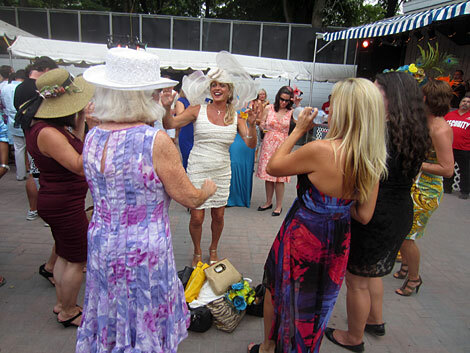 Purses in the middle like a bonfire, racetrack fans begin the Siro's dance party right after the last race is run. The Chamber of Commerce calls the meet’s final weekend the “Final Stretch Festival.” At the races, the final stretch, for the most part, began at the start. Pacesetting horses predominated. Seven of the nine winners led at the quarter pole; the other two were within a half-length of the front. In the fourth race, Manuka Honey, a first-time starter for trainer John Terranova, surrendered the lead to Sustained after speeding a mile in :22.60, :46.90, 1:10.78 and 1:35.91. In the seventh race, Cape Glory held a slim advantage with less than a furlong to go before giving in to Conspiracy. 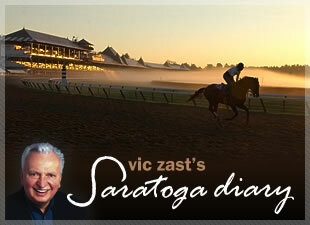 The Saratogian reported that an Albany man in his mid-60s arrived at the track in a blazer and dress shoes, but returned home on a bus wearing a pair of women’s shorts and flip-flops. His change in attire was provided by a Saratoga Springs resident on Saratoga Lake, who found him chest-deep in a small, mucky creek in the backyard of his Stockholm Road property at 7 a.m. The man had spent the night there before the fire department pulled him out with a harness. Fridays are fish days. So it comes as some surprise that Moby Rick, a fishmonger for Pura Vida of Hampton Bays, N.Y., has missed being in business for weeks while preparing his new store on Lake Street. Things take longer than they do in a small town. But perhaps Rick is satisfied in selling his seafood on Saturdays off the back of a truck at the farmer’s market. Horseplayers are meat-eaters anyway. 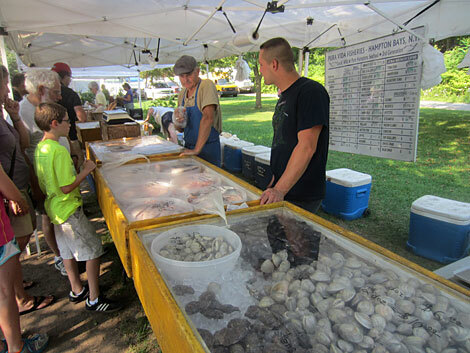 Fishmongers at the Farmer's Market. The flag in the infield was flown at half-mast. MTV cancelled Jersey Shore.